Seeing the castle for the first time or the fifth time is always impressive! 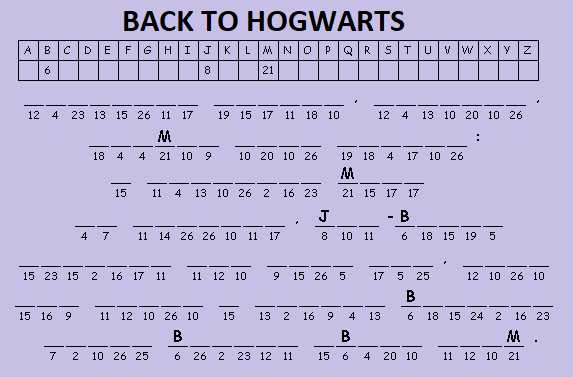 Complete this Hogwarts Cryptogram and PM (private message) me a screenshot of the puzzle or you can just send me the phrase by September 30 for 20 HOOTS*! If you get stuck, send me a PM and we'll see what we can do to help you through it! Prof. Tarma Amelia Black is the first to turn this in, followed by Vanessa Tilley!!! Who's next?? "Hogwarts Castle, however, loomed ever closer: a towering mass of turrets, jet-black against the dark sky, here and there a window blazing fiery bright above them."